← 3D Week: The three interconnect crises of the electronics industry and the inevitability of 3D. Believable? 3D Week: Wide I/O SDRAM, Network on Chip, Multicore, TSV, Asynchronous Logic—3D SoC stack from CEA-Leti and ST-Ericsson hits all the advanced notes. Can you say “Tour de Force”? Yesterday, at the RTI 3D Conference, Pascal Vivet from CEA-Leti and Vincent Guérin from ST-Ericsson unveiled a 3D IC project that represents a real Tour de Force of cutting-edge system technology. The quest starts with a key question: “What’s the right architecture for dealing with large numbers of processor cores and other processing resources?” The next question is: “What’s the right way of connecting main memory to large numbers of processors in a multicore processing engine?” The 3D IC project outlined yesterday by Vivet and Guérin provides one set of answers to those two questions and to many more. The project included the development of a logic SoC, dubbed WIOMING (Wide IO Memory Interface Next Generation) that is designed from the ground up to be used in a 3D IC stack. The project’s objectives include creating 3D IC stacks with one WIOMING SoC stacked with an SDRAM, two stacked WIOMING SoCs, and two WIOMING SoCs with attached DRAM. This set of objectives led to a very specific design approach for the WIOMING SoC. From a certain perspective, this 3D project started with the new JEDEC Wide I/O SDRAM memory spec. Coincidentally, Ken Shoemaker—who is vice-chair of the JEDEC 42.6 Low-Power Memories subcommittee—confirmed during a GSA 3D IC Working Group meeting held on Monday of this week that the JEDEC Wide I/O specification had just been finalized, approved by the directors, and would soon be published. The objective of the Wide I/O interface spec was to define an SDRAM interface that delivers twice the bandwidth of the LPDDR2 specification at the same operating power and to allow for thinner, smaller system form factors specifically through the use of TSVs (through silicon vias). Because of its suitability to multicore systems designs, the Wide I/O SDRAM interface became a key part of the WIOMING design project and the Wide I/O SDRAM controller blocks were the first parts of the SoC to be developed. 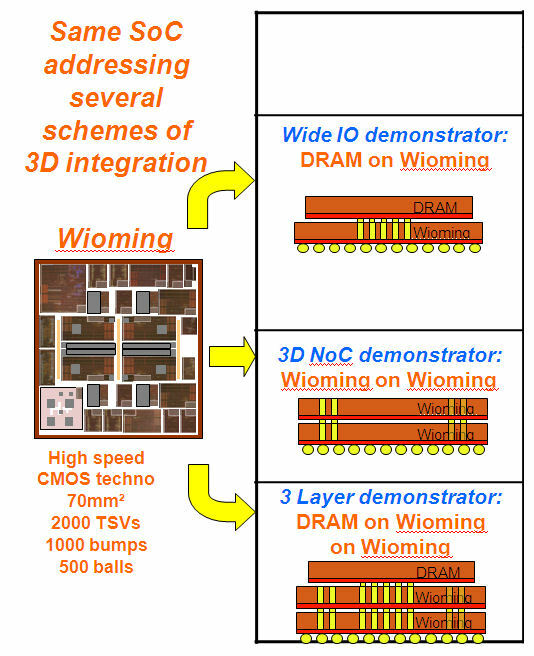 One key Wide I/O SDRAM characteristic that defined WIOMING was the 3D TSV pitch defined in the Wide I/O spec. The Wide I/O spec calls for an array of interface pads using an array spacing of 40×50 µm. That specification defined the TSV pitch for the memory-interface part of the WIOMING SoC and, consequently, for the entire chip. The WIOMING SoC design uses 10µm TSVs with a 10µm keep-out area around the TSV. Four such blocks are used in the WIOMING design to handle the Wide I/O SDRAM’s four independent 128-bit memory channels. 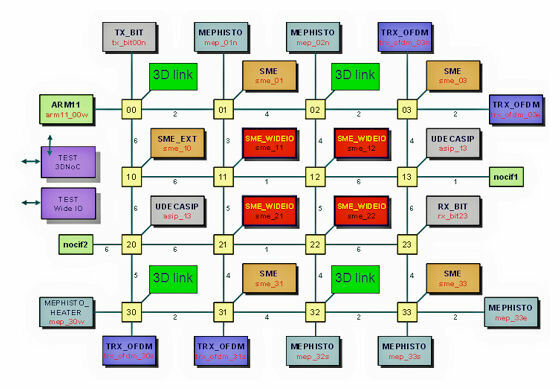 Each Wide I/O SDRAM controller block is separately addressable within the WIOMING SoC’s on-chip network. Target frequencies for the processors ranges from 350 to 400MHz. 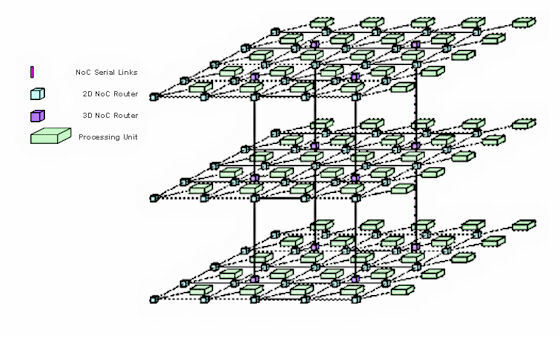 The 3D TSV NoC links (Up and Down) are shown in green. The four Wide I/O SDRAM controllers appear in red in the center of the system diagram. Other system resources are located on the periphery of the network. The NoC as implemented is capable of transmitting 550 MFlits/sec in within the plane of the SoC and 200 MFlits/sec through each of the four connecting TSV connections. Note in this diagram that there are four NoC connections between each 2D NoC plane. If each of the 16 2D NoC routers in the WIOMING 2D mesh had been implemented as a 3D router, there would be 16 connections between planes. The presenters said that this was a conscious tradeoff between network connectivity, bandwidth, and transistor count. Each TSV consumes silicon that might otherwise be used by thousands of transistors. The WIOMING SoC was taped out at the end of October. Circuit testing and qualification will take place during Q1 of 2012 and boards with the 3D assemblies will start ramping up the following quarter. For Richard Goering’s take on this announcement, click here. For Jim Handy’s take on this announcement, click here. 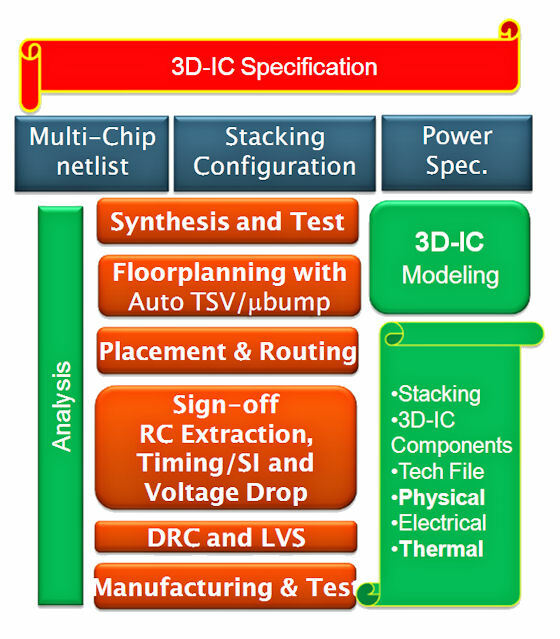 This entry was posted in 3D, ARM, EDA360, Silicon Realization, SoC, SoC Realization, System Realization and tagged 3D, Cadence, Leti, LTE, Multicore, NoC, ST Ericsson, TSV, Wide I/O. Bookmark the permalink.